You know those pictures you see of orange tori gates lined up one after another, creating a fantastic tunnel? 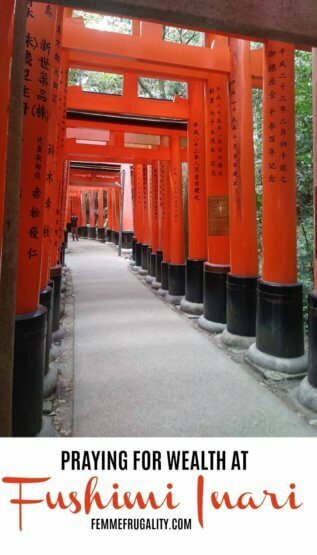 Those pictures are of Fushimi Inari in Kyoto. Visiting there was a really cool experience for my sibling and I while we were on our trip to Japan. If you’re taking a JR train to Fushimi Inari, you’re in for a treat. It’s a super quick train ride away, and you’ll be met with the first orange tori gate when you step out of the station. You literally just have to walk across the street. Once you pass through this first gate, you’ll enter a huge complex with places to pray and shops to purchase souvenirs. From there, you’ll enter the first tunnel of tori gates. Bear in mind that this path will take you up a mountain–wear appropriate clothing for your trek! The gates get thinner the higher up you go up–the most condensed section is right there at the bottom. We were told that when you pray at Fushimi Inari, you are undertaking an obligation. The complex is set up as a shinto shrine dedicated to wishes for wealth. Should your wish be granted, you should use a portion of your money to donate another one of these orange gates. That means that the tunnel created by the gates isn’t just a cool way to get people to come pray; it’s a manifestation of the success people and organizations have had since offering their prayers. It’s also why the gates are closer together at the base of the mountain rather than the top; odds are that by the time you visit, there will be more gates up at the top than when I went as more wishes for wealth are granted! Am I Praying for Wealth or Something Else? When we made it to the main shrine, I threw in my go yen and prayed. I found myself praying for wealth, sure. Because that’s what you do when you’re there. But I also found myself not so much desiring material gains for material gains’ sake. I found myself praying for the things money can grant: independence, freedom (hopefully to travel some more! ), and the ability to be an actor in my own life rather than a passive vessel. To create my own path rather than being forced to walk upon one I had been told to travel. Because it isn’t ever really about money. It’s really easy to fall into the numbers trap, measuring our success with a calculator in hand. But the reasons we pursue money are our true driving motivators, and we should never lose site of them. They’re what keep us grounded, and what can push us to keep going when things get hard. I’ll be sure to let you guys know if they ever end up erecting an orange gate in my name. What would you pray for at Fushimi Inari, besides the obvious request for cash? This entry was posted in Think, travel and tagged Japan on June 1, 2018 by femmefrugality.